A list of Words with the identity of each word being indicated by a Clue, just as happens in a standard crossword puzzle. These words do not interlink with each other, but the set of first letters, taken in order, spell out an additional word (or phrase or sentence) which is referred to as the Key Word. A Key Paragraph which appears in a grid with the spaces between words being represented by means of black cells. 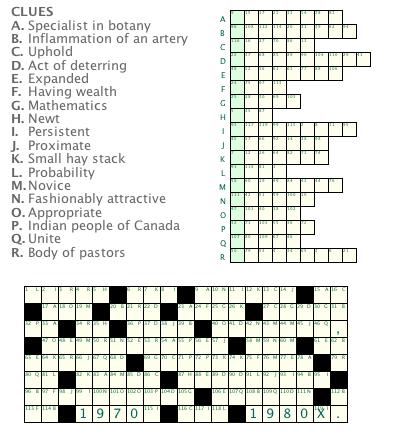 This results in an appearance which is very similar to that of a traditional crossword puzzle. Typically, the Key Paragraph will be a clue to the identity of the Key Word mentioned above. Each letter in the list of Words also appears in the Key Paragraph, and its location in the Key Paragraph is indicated by means of an identification number. Similarly, each letter in the Key Paragraph appears in the list of Words, and its location is indicated by means of both the identification number, and an identifying letter to show the Word which contains it. 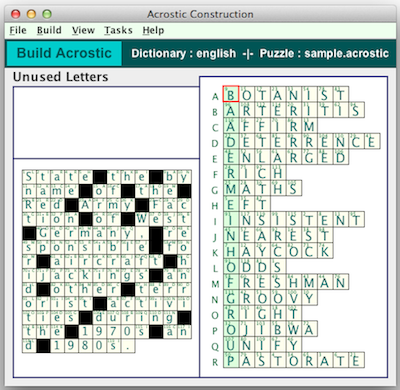 These graphics show a Acrostic puzzle in the Crossword Express Build screen and a PNG graphic file produced by the program's print function, showing the complete puzzle. See also a full size version of a PDF file showing the complete puzzle. Manual construction is also available. Select a word slot and ask for suggestions. The program provides a list of possibilities from which you can make a selection. Alternatively, you can enter a number of words manually, and then request the program to complete the construction process. Words added manually can be extracted using the Extract Word function if it becomes necessary to backtrack on the design. Clues can be added to those words requiring them, or existing clues can be edited using the Add a Clue function.